I’m going to begin by professing my love for Twitter. Not only does Twitter allow me to keep in touch with my photography friends (and fellow Muses) all over the world, it has put me in touch with a group of local photographers who like to get together over beers and nerd out over gear, etc. (aka, my kind of people). So it was as a result of a Twitter conversation that I found myself on a pre-dawn mission with five other over-tired and under-caffeinated photographers. 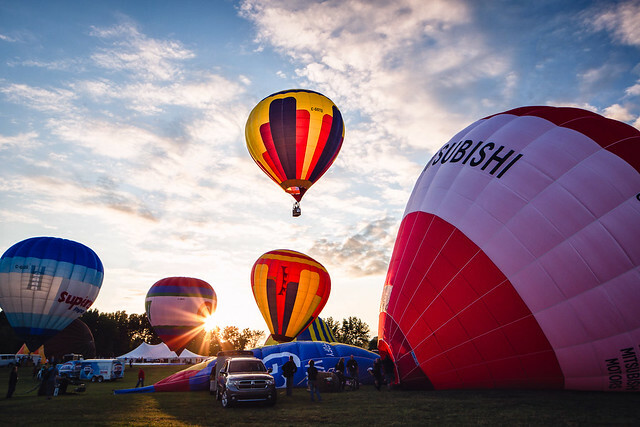 We were off to watch the sunrise launch of the hot air balloons as part of the Festival de Montgolfiéres de Gatineau. Pretty Dreamy, right? As dark turned to dawn we made our way over to the launch site and began unpacking gear as close to the action as we were allowed to get. For some of us (i.e., me) “unpacking gear” meant “pull Polaroid out of bag and put iPhone in back pocket”. Others had tripods and a variety of lenses to play with. 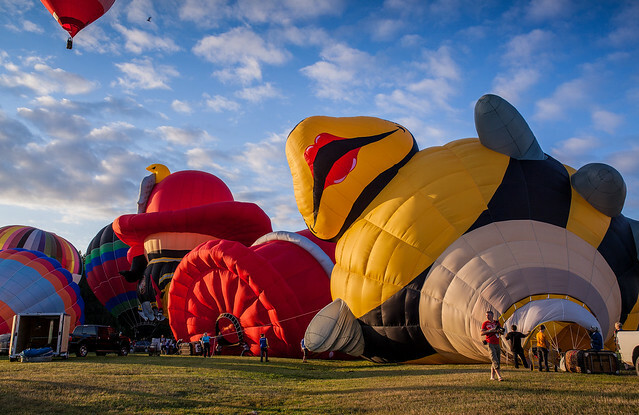 As the sun started to rise the empty field in front of us began to buzz with activity as trucks dropped off baskets and balloons were unfurled. After a bit of back and forth and some fanfare the green flag was raised and the go sign was given to inflate the balloons. We were on. 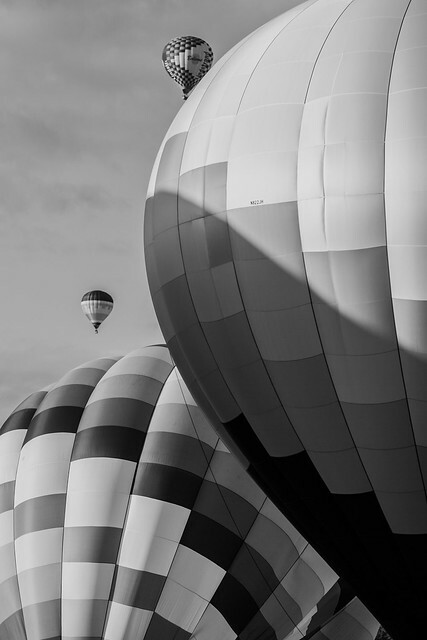 While it was a pretty spectacular sight to watch the balloons inflate and then take off one by one into the sky, the setting offered some photographic challenges. At ground level there was a lot going on. There were many people walking around, many ballons being arranged and inflated and some pesky advertising banners, all of which made it challenging to get an interesting wide shot. Shooting balloons in the sky was also a bit of a trick because there was a fine line of time between when they rose above the visual clutter to when they were too far away to photograph. Let’s just say that not every shot was a winner. However, when I’m shooting Polaroid, any day that I walk away with one or two shots that I really love is a good day. As well, any morning spent in the company of good people who are as passionate about making pictures as I am is a good one. They have also kindly let me share some of their shots from the morning here with you. Justin was working two camera bodies, on with a wide angle and the other with a mid-telephoto. I love me some sun flare, plus the glow of the balloon in the air. 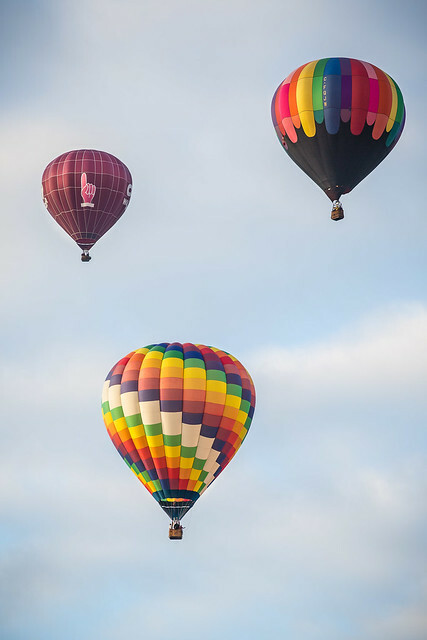 And here the longer lens gives a great view of the balloons as they sail away. I love how this one of Ian‘s captures the organized chaos of the morning. So many balloons in a pretty tight space in varying states of inflation. And you know me, usually I’m all about the colour but the graphic quality of the black and white edit here really grabs me. Amanda was working hand-held with (I think) a 70-300mm lens, which gave her a different perspective on the action. I love the flames! And as for me? As I mentioned, I shot mostly Polaroid. 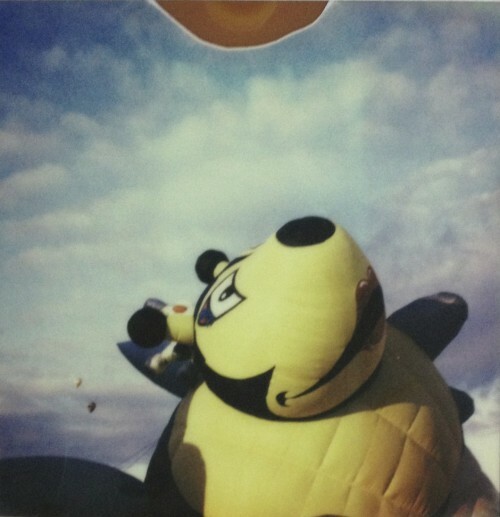 In this case the limitations posed by the camera and the film are part of the fun. I like how this one looks a little surreal. I remember at one point turning to Justin and saying “these are Polaroid skies”. This photo captures exactly what I meant by that. Thanks to Amanda, Justin and Ian for letting me share your photos here and, along with Michelle and Younes, for a fun morning’s photo adventure. Oh, how pretty!! Love all the different perspectives on this event. 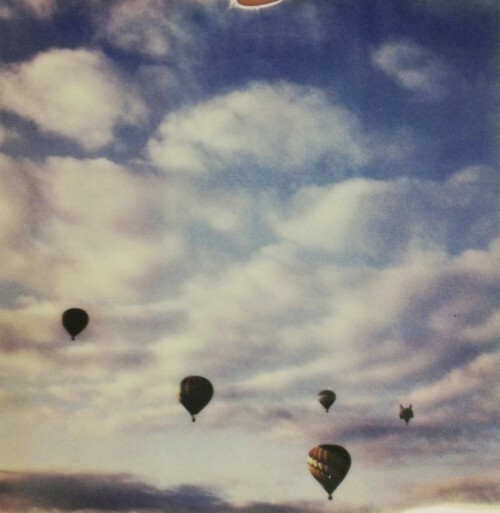 Reminds me of one of my best presents ever – a balloon ride over the Mexican desert on Christmas day. ADORE this post, Deb. Love all these photos and the different perspectives. Really showcases the range of photography. Awesome! 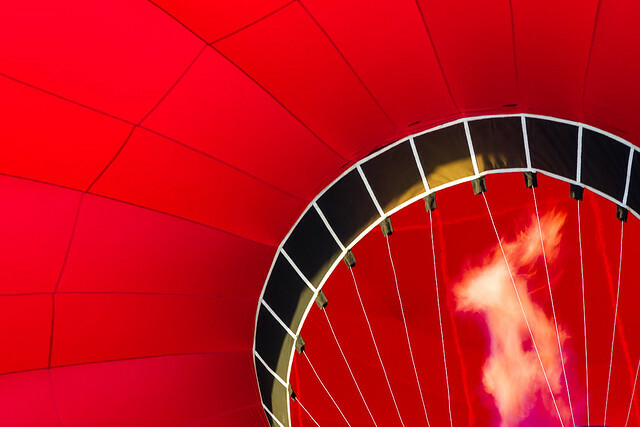 One of my life wishes is to ride in a hot air balloon. The photos that you shared, got me even more excited. This is so cool Debra! I love all the different perspectives! You’re polaroids are incredibly dreamy too! Beautiful! There is one coming up in this area. I would so love to have some friends to go with. Doing it on my own is daunting! Wow. These photos are all awesome!! So glad you found this group of photo friends to go on this early morning journey!! Gorgeous bright colours. 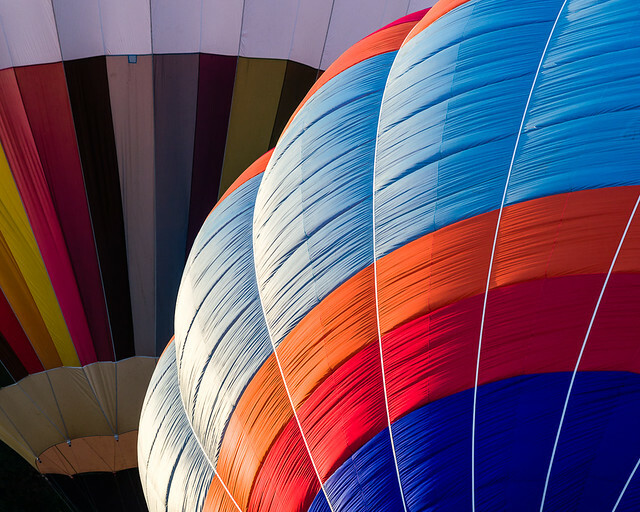 Hot air balloons are such a peaceful sight and so beautifully captured in all these shots. great post, debra! love your polas and really love that you shared some images of your fellow photographer friends. this internet business sure does some amazing real-time connecting, doesn’t it? !